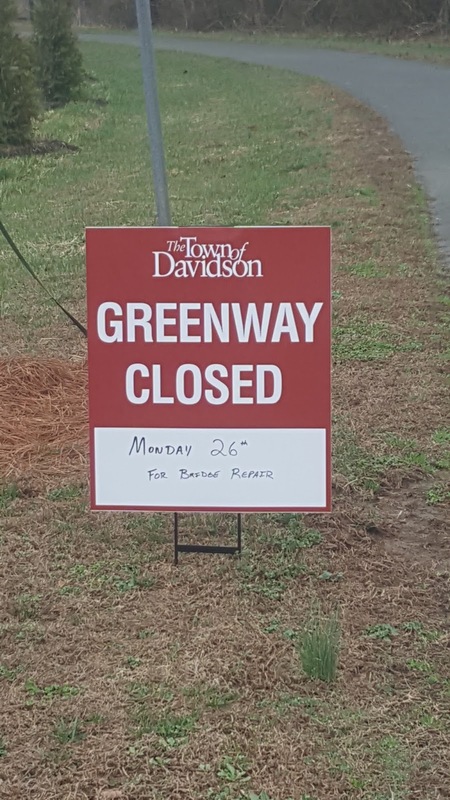 DAVIDSON, NC – The Town of Davidson is pleased to announce the receipt of a $91,817 grant to stabilize the stream behind Davidson Elementary School on South Street. The grant is part of the Water Resources Fund, a $10 million commitment from Duke Energy. The Town of Davidson is one of 14 organizations across North and South Carolina to collectively receive more than $1 million in the fifth grant announcement. The Water Resources Fund is a multi-year commitment that will leave a legacy of improved water quality, quantity and conservation in the Carolinas and neighboring regions. Work will include the protection of existing habitat along the Davidson Elementary School eco-trail and improvement of water quality by reducing sediment pollution downstream. We will also stabilize substantial erosion along the South Prong West Branch of the Rocky River due to a significant drop in the stream. The Town of Davidson Planning Department has proposed approximately 25 text amendments to the watershed chapter of the Davidson Planning Ordinance (DPO). A public hearing is scheduled for March 13th and the Board of Commissioners is scheduled to vote on the changes April 10th. Both meetings are at Davidson Town Hall at 6:00 pm. In a memo to the Board of Commissioners dated 2/27/2018, Planning Director Jason Burdette states that the purpose of the changes “is to keep our drinking water in Lake Norman clean.” Burdette has also stated in multiple board meetings that Mecklenburg County Land Use & Environmental Services Agency (LUESA) has asked the planning department to “tighten up” the watershed ordinance. What are the major changes? Which changes were recommended by LUESA and which were recommended by the Town? What was the catalyst for the Town-driven changes? What properties do they impact? What are the intended and unintended consequences? Who benefits and who loses? A thorough analysis reveals that under the misleading disguise of pure “drinking water,” “flexibility,” and “more thoughtful design,” the amendments will: increase variances, increase density, limit the construction of single family homes, increase opportunities for high-density developers, encourage density averaging, threaten the tree canopy, change stormwater requirements by deleting the wet detention pond requirement, and increase impervious footprints for commercial redevelopment purposes. The owner of one of the nine remaining mill homes on Delburg expressed major concern during the February 13th public comment period. The resident stated a loophole currently allows pre-1993 smaller lots to be excluded from the 24% impervious limits. This loophole has allowed the demolition of mill homes and subsequent construction of larger homes on Delburg Street. Under the new ordinance, the mill home owner would not be permitted the same right. Thankfully, the planning staff have rewritten this particular text amendment in response to public outcry. The latest version of the text amendment (subject to LUESA approval) will allow the loophole for residents who have owned their home since 1993. But what about the rest of us? How many of us have lived here or owned our property for over 25 years? The original watershed ordinance clearly intended to exempt existing single-family lots, with or without a house on them. The text amendments remove that pro-single-family bias completely to the benefit of commercial development. The text amendments will allow developers in the Village Commerce and Village Center to increase their impervious footprint beyond 50 percent. Under the moralistic veil of maintaining “greater stability for single-family lots subject to development pressures by clarifying and affirming rights of long-standing landowners and their families” (Memo 2/27/2018), is a push for apartments, quadplexes, Village Courtyards and Village Walkups. The new Board of Commissioners tabled the Missing Middle, but the text amendment phoenix has risen from the ashes. Wag the Dog and Grab the Land! 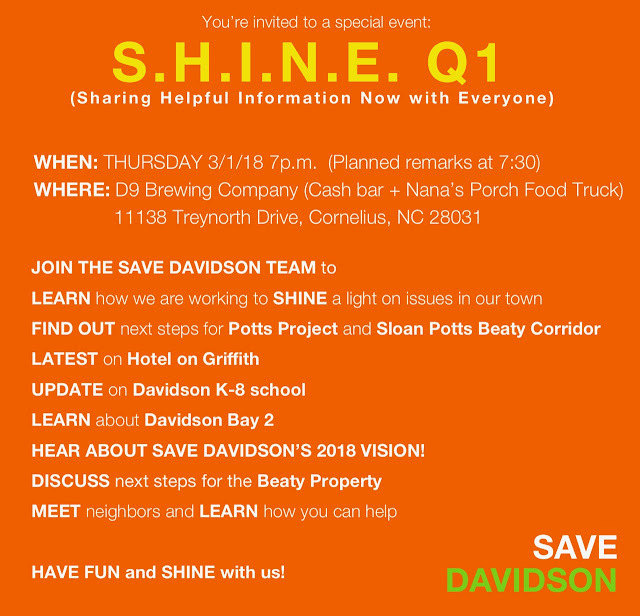 The Save Davidson community activism organization will be hosting a SHINE event this Thursday at the D9 Brewing Company in Cornelius. Socializing starts at 7pm with community updates beginning at 730pm. Come early if you want dinner. Nana's Food Truck will be available to serve you. SHINE stands for Sharing Helpful Information Now for Everyone. These events cover the hot topics going on in Davidson that directly impact citizens - delivered without the Town Hall spin. 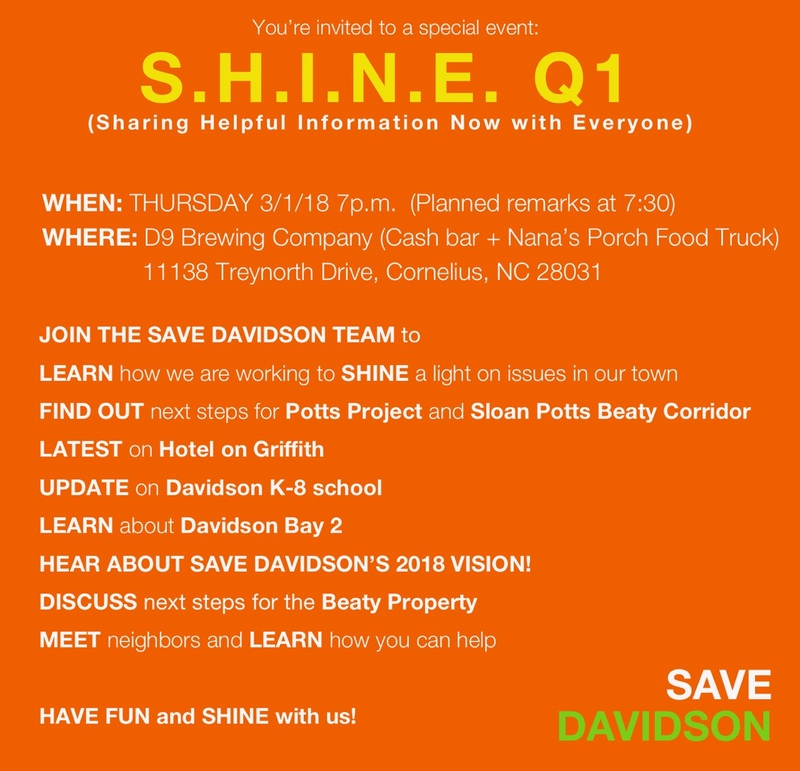 SHINE events were a popular hallmark of last year's rise of Save Davidson as force to be reckoned with when it comes to what and how things get done in North Mecklenburg 's smallest municipality. The 2017 gatherings each drew about 100 attendees. For 2018 Save Davidson looks to make these quarterly events. If you are interested in meeting people in town willing to get off the couch and actually do something when it comes to Davidson Town Hall, this is the place for you. This past week something came out of Davidson Town Hall that you don't often see, a public shot from one Commissioner aimed at another - or in this case two others. Typically, in genteel Davidson that is unheard of - even when it would have been deserved. Remember the kid gloves former Mayor Woods was treated with when he went to Raleigh to push for the I77 tolls with Senator Berger? Senator Berger was and likely still is the most powerful politician in the state. 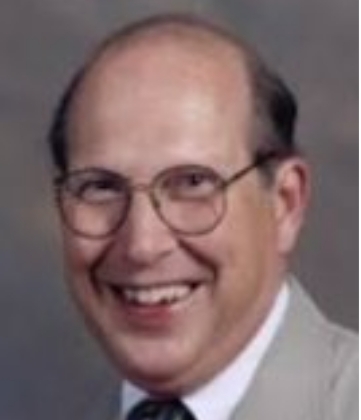 Even in that case where asking for then Mayor Woods's resignation would have been justified (as was done in Cornelius with Chuck Travis over the same issue), Davidson's Board only gave Woods what can best be described as a slap on the wrist with a wet noodle. Last week that predilection against public divisiveness between Board members changed over something it shouldn't have. Newly minted Davidson Commissioner Jane Campbell launched the criticism from her campaign Facebook page at fellow newly minted Commissioners Matthew Fort and David Sitton over their names (and titles of Commissioner) being listed on campaign literature as endorsing State Senator Jeff Tarte of Cornelius in his reelection campaign for the NC Senate 41 seat. So far, Tarte faces Democrat Natasha Marcus of Davidson in filing for that race. Both Marcus and Campbell have previously run for state office against Republican John Bradford for the NC House 98 seat. In her campaign site Facebook post, Campbell takes issue with Fort and Sitton endorsing because they were elected as "nonpartisan" candidates to the Board of Commissioners, and the NC Senate race is a "partisan" race. She takes particular issue with their names being posted along with their titles of Commissioner of Davidson. She also points out that Sitton and Fort made these endorsements without talking to Marcus who also happens to be a Davidson resident. Campbell says she discussed the issue of "endorsements" and her opposition to Commissioners endorsing at the Board's late January retreat. aShortChronicle interviewed Campbell on a separate topic a couple weeks prior to the retreat. Campbell mentioned then that she was going to bring up the issue of endorsements at the 2-day meeting, so it wasn't something that she thought up on the fly. While Campbell is perfectly within her rights to have an opinion on the topic, that doesn't mean she's right to publicly criticize her fellow Commissioners over it. First of all, there is nothing sacrosanct about nonpartisan office that should take away an elected official's right to endorse candidates in partisan races. There is no law against it, and it happens all the time. In fact, in the same announcement from the Tarte Campaign that listed Fort and Sitton, four of five Cornelius Commissioners and all six Huntersville Commissioners are also listed as supporting Tarte. aShortChronicle also did a little historical research and found that when Tarte first ran for NC Senate back in 2012 he was endorsed by multiple nonpartisan elected officials from numerous towns including several Mayors (Tarte was himself Mayor of Cornelius at the time.) These endorsements occurred during the Republican primary, an intra-party partisan race. One of those endorsements even included Former Davidson Mayor John Woods. During that race there was no Democrat running, so the real race was in the Republican primary. Partisan endorsements involving nonpartisan officeholders happen the other way too. Take for example judicial races. When those were nonpartisan, both political parties recommended candidates for these races on their partisan voter guides. If fact, if you've ever handed out partisan voter guides you'll know it was these judicial nonpartisan recommendations were often the only reason voters actually would take a voter guide. They wanted that information. You can be sure the Democratic Party and Republican Party partisan guides were picking nonpartisan judicial candidates that aligned most to their partisan ideologies. A second reason Campbell's public critique was off base is the idea that the act of endorsing was somehow made worse because Fort and Sitton not only had their names but their official title of Commissioner included. Let's be clear. When an elected official does anything "political" they are implicitly doing it with their elected title attached. To pretend otherwise by leaving the title off is simply not credible. Remember that example of former Mayor Woods going to Raleigh to advocate for the tolls? Nobody believed him when he said he didn't do that as "Mayor" but only as a private citizen. Somewhat ironically, Campbell tried the same gambit in her post calling out Fort and Sitton, saying that she never sought out endorsements from Davidson commissioners in her 2016 race against John Bradford. However, she did acknowledge accepting campaign donations from Davidson electeds. So while there wasn't an official "endorsement", most reasonable people would say donating money to a candidate is about the biggest "endorsement" one can give. The saying put your money where your mouth is comes to mind. Acting like there is any real difference is simply not believable and comes off as splitting hairs. A third reason why this critique of Sitton and Fort didn't make any sense is that there is a very practical matter where local officials endorsing state candidates actually does make sense. North Carolina is what's called a "Dillon Rule" state, meaning municipalities only have the authority explicitly granted to them by the State. Under those circumstances one can actually see it as a positive thing for local officials, nonpartisan or otherwise, to want to get candidates elected at the State level who they thought would be the most effective at helping them on issues having impact locally. Davidson has long had a history of not having the best relationship with Raleigh. If individual Commissioners endorsing candidates has the possibility of improving that in any way by building or strengthening relationships, then not doing so is potentially nothing but a lost opportunity. The last thing that bugs aShortChronicle about this issue is the timing. The issue was discussed at the January 25-26 retreat. The endorsements in question were actually posted to Senator Tarte's campaign Facebook page also on January 25th. Why bring it up again nearly a month later? Well, filing is now underway, and people are starting to pay attention to these races. The timing of this and the fact that Campbell went beyond simply saying she doesn't plan to endorse candidates but used her statement to take a swipe at others who supported a candidate she likely would never would have endorsed herself, makes this whole tempest in a teapot look more political - partisanly political - than anything else. DAVIDSON, NC -- The Town of Davidson Board of Commissioners will meet on Tuesday, February 27 in the Davidson Town Hall board room at 4:00 p.m. for their work session and at 6:00 p.m. for their regularly scheduled meeting. The most recent agenda and associated documents are now available via this link. WORK SESSION - 4:00 p.m.
SUMMARY: Overview of the park at Bailey Springs plan, process, and timeline to date. SUMMARY: The BOC has historically appropriated $50,000 to be distributed among qualified, registered, town-based non-profits that apply for funding. We would like to accept applications for the 2018 funding cycle March 1 - April 6. The Livability Board would make initial recommendations at its April 17 meeting and finalize at its May 15 meeting so that the BOC could allocate funding at its June 12 meeting. SUMMARY: At their January retreat, the mayor and board of commissioners set their vision and goals for the Town of Davidson. The main action item from the retreat was to create a strategic plan, including tactical steps, for 2018-2019 so town staff can help achieve the board’s goals. Town Manager Jamie Justice will present the draft strategic plan (see attachment) to the mayor and commissioners at the February 27 meeting, engage in a discussion, make edits, and request more direction from the board. Staff will finalize the strategic plan, and members of the community will have the opportunity to review it and comment before the board of commissioners consider it for adoption at a future meeting. REGULAR BOARD OF COMMISSIONERS MEETING - 6:00 p.m.
SUMMARY: The Design Review Board will provide an update on recent activities and projects that have come before the advisory board. SUMMARY: Community Development Block Grants are federal funds for projects that fit specific criteria. These funds are administered through a consortium of which the Town of Davidson is a part of. Staff recommends the town apply for grant funding for sidewalk projects and improvements to Roosevelt Wilson Park. The Town Board is asked to approve these applications. SUMMARY: Per Mecklenburg County's recommendation, planning staff proposes changes to Section 17 (Watershed) of the planning ordinance. Staff will provide an update to these changes, including recent citizen concerns. SUMMARY: As a follow-up to the February 13 public facilities discussion, the board will discuss alternatives to the original project. Staff is looking for direction on which options to pursue over the 90-day due diligence period. SUMMARY: Discussion of the potential projects for the Mobility and Greenway GO Bonds. This is part one, the Parks & Rec potential projects will be reviewed at the Mar 27 board meeting. SUMMARY: Staff will provide options to begin the Comprehensive Plan update process. SUMMARY: At their January 2018 retreat, the Davidson Mayor and Board of Commissioners discussed the Town of Davidson’s vision and core value #5. Since time did not allow for the amendments to the vision and core value to be completed during the retreat, the task was delegated to the Public Information Officer to continue wordsmithing. During this time at the February 27th meeting, the mayor and commissioners will be able to offer up their suggestions for further wordsmithing and next steps. You will be able to watch the live video of the meetings and view the PowerPoints simultaneously via NovusAgenda. Click the camera icon to the left of the “2/27/18” meeting title to watch and click the “online agenda” icon to the right of the “2/27/18” meeting title to follow along with the presentations. After meetings are live streamed, they are saved on the agenda for future viewing. Has Davidson finally gotten itself a fiscally conservative Board? This is a question aShortChronicle has wanted to ask for a while now, years in fact. However, it was really a rhetorical question, a moot point. The answer would have always been "no". The Boards since Mi-Connection did make progress on some things. They had to. The financially disastrous decision to enter the cable business gave them no choice, but there were always costs. Yes, Davidson's Board in 2012 agreed to a new inter local agreement with Mooresville that capped the Town's out of pocket annual expense for Mi-Connection at $1 million. That was a good thing. However, that agreement also fixed Davidson's ownership percentage of Mi-Connection at 30%, taking away the town's only real negotiating leverage with its Mooresville business partner. That's not a good thing. Under the current agreement, Davidson can no longer potentially dump its customer base and leave Mooresville holding all or most of the debt. While the 2012 agreement kept Davidson from immediately going over the financial cliff, it also kept the town tethered to the company so if Mi-Connection (now Continuum) goes down in the future, Davidson goes with it. Yes, the previous Board that left office last December got the town's 2nd fire station underway, something that has long been sorely needed. However, they also laid the groundwork for massive tax increases by pushing a bond package for "nice to have" items while simultaneously pushing plans for a new Town Hall and public safety facilities without going to voters. Putting all of these projects before voters might have resulted in some of the "nice to haves" not passing. To aShortChronicle the tactic of putting some but not all of this proposed spending before the voters was a clear manipulation of the situation designed to get all if the spending underway and thus eventually burden taxpayers with as much as a 25% tax increase. The long wait for some version of fiscal conservatism at Davidson Town Hall may be over though. After listening to Davidson's newly elected Board at the 2/13 meeting last week and at The Egg on Monday, it seems clear there may be a new view on spending taxpayer money at Davidson Town Hall. Comments from Commissioners Sitton and Campbell in particular should give taxpayers heart. At the 2/13 Board meeting when describing why towns spend massively on projects like the proposed new Town Hall building, Sitton explained why saying "we have a guaranteed Revenue Source in perpetuity and that's you. I'm not sure that's a good reason." At the same meeting, Campbell described the trifecta of Mi-Connection, the proposed public facilities debt, and spending the approved GO Bonds by saying "I am concerned with the potential perfect financial storm that brews with this." After this discussion, the Board put this project on "pause" while it looks a at more creative solutions that don't bust the budget. At The Egg "Chat" meeting with electeds this past Monday, there was a lot of discussion about fiscal issues as well. While the overall fiscal situation may make dramatic improvements in taxes unlikely, the electeds didn't discount citizen concerns either. That in and of itself is a step in the right direction compared to how fiscal concerns were often treated in the past. There is a lot of ground to cover before one can really answer the question posed here about the new Board's true fiscal view of things, including putting together its first budget in the next few months. However, if the early indications and rhetoric are any clue, things look more promising than they have in years. It seems safe to say, taxpayers likely won'tbe footing the bill for anything like this in the near future. With unseasonably warm weather here for an extended period, people may be thinking of hitting the greenways. If you are one of those thinking of doing so, get your fix in this week and this coming weekend. Next week portions of the West Branch greenway will be closed for bridge maintenance. 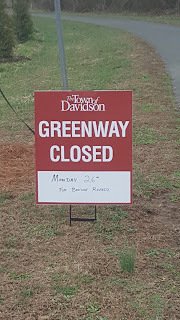 The below signs are posted visible where the greenway crosses Robert Walker Drive. According to the signage, the southern most section will be closed next Monday with the remainder closed Tuesday through Friday. 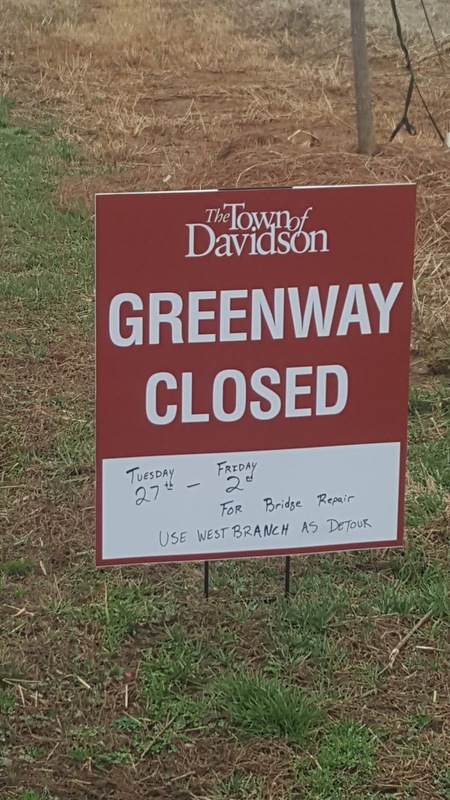 Readers may be wondering if the work is related to the damage suffered by the greenway last year after the West Branch neighborhood construction began and there were some flooding rains. Per the Town's Public Works Director, Doug Wright, that is not the case. Instead, these closures are just routine maintenance. Hot topics tonight included: public facilities, the Continuum of MI-Connection, solid waste fee, attention to neighborhoods in the West Side of Davidson, mobility bonds, watershed text amendments, Hyatt Hotel lawsuit, planning department power, Beaty Park, and public input at town hall meetings. Commissioner Matthew Fort explained that police and fire are out of space. The commissioners are searching for solutions that include using an existing building, such as the old IB school/Lake Norman Christian building on South Street, for administrative offices while keeping the current town hall for police and fire. Citizens provided additional recommendations for public facilities including: approving one of the six plans presented last week by Assistant Town Manager, Dawn Blobaum, renting space, finding available land, or utilizing drop-in workspace. Commissioners Jane Campbell, David Sitton, Matthew Fort and Jim Fuller expressed concerns about spending an entire year’s budget on public facilities. Fuller and Campbell both stressed the importance of allowing the public to weigh in through a public referendum. Citizens pointed out that the solid waste fee is used to support MI-Connection/Continuum debt. Two citizens representing the African-American community stated disapproval of this fee. Commissioner Fort posed a solution that involves rolling the fee into taxes so that residents can deduct the fee. A representative from the African-American community requested more attention to issues in the West Side neighborhoods. Commissioner Sitton explained plans to discuss use of the mobility bonds at the next board meeting. Two citizens questioned the proposed watershed text amendments that possibly benefit density and development over single-family homeowners, tree canopy and the environment. Commissioner Sitton indicated plans to create a Beaty Park task force. A citizen requested that controversial topics be addressed first at Town Hall board meetings. Davidson Coffee Chat on Monday, February 19 at 6:30 p.m.
DAVIDSON, NC -- The Town of Davidson Board of Commissioners invite all community members to attend a Davidson Coffee Chat on Monday, February 19 from 6:30 to 7:30 p.m. at The Egg at Davidson located at 231 Griffith Street in Sadler Square. These coffee chats are informal meetings and are typically held the third Monday of the month so attendees can ask questions on issues and projects in the Town of Davidson. The next chat is scheduled for Monday, March 19 at 9:00 a.m. at The Egg at Davidson. ● Mayor Knox stated that the current elected officials consulted with both the town attorney and outside counsel regarding the Hyatt Hotel Lawsuit during a closed session. He could not comment further at this time, but said more information is forthcoming. ● A resident voiced major concern regarding the proposed Watershed Ordinance Text Amendments and the lack of public notice. Ordinance 17.7.1.2 “Built-Upon Area Limits” states that with the Low Density Option (single family home) “Development shall not exceed a built-upon area of 24 percent.” The resident stated that this text amendment is unfair to the nine mill home owners in the Delburg area (and other homeowners in the Critical Watershed). She would like to renovate or demolish and rebuild her 1911 home. According to the 24% impervious rule, she could only build a 100-300 square foot home with a driveway and garage. However, a developer would be allowed to buy several lots and build a master plan with 50% impervious using engineered stormwater. The resident requested that her lot be grandfathered or she be allowed more time to build before the text amendment potentially passes. ● The remaining speakers focused on using taxpayer funds for another Mobility Plan, lack of infrastructure, and the solid waste fee. ● The board unanimously approved the first “Community Dinner” to be held on The Green, possibly on Town Day (May 5th). Economic Development Manager, Kim Flemming, stated that the main course, water and tea for 500 citizens will be provided by the town at a cost of $3,500-$4,000. ● Assistant Town Manager, Dawn Blobaum, presented the board with six options for the Public Facilities Project. The board voiced unanimous support for additional police and fire space. The board then created “Option Seven” (aka PAUSE) which includes: studying the plan for 90 more days, allowing a public referendum, looking at it holistically, potentially using the current town hall for fire and police, and looking for a creative solution (potentially using an existing building) for administrative offices. ● Mayor Knox and Town Manager, Jamie Justice, addressed public concern regarding the Mobility Plan. They both stressed that the plan will address four types of transportation (pedestrian, bicycle, automobile and transit), not just walking and biking paths. Commissioners David Sitton and Autumn Michael both continued to push for synergy between the Comprehensive Plan and Mobility Plan. Michael expressed concern that we are “putting the cart before the horse” by creating the Mobility Plan first. Commissioner Matthew Fort requested that the town “put a fresh set of eyes” on mobility in the future, whereas the current firm chosen to study our mobility, Alta Planning, was the same firm that studied the town's mobility in 2013. - Commissioner Sitton responds to concern that the Watershed Ordinance Text Amendments favor developers over single-family homeowners. - Commissioner Matthew Fort addresses the Hyatt Hotel lawsuit. - Town Manager Jamie Justice acknowledges concerns about the redundancy of mobility plans. - Commissioner Jane Campbell notes the debt-trifecta problems that could price residents out of their homes: Mi-Connection/Continuum, $15 million Public Facilities Project, and the Mecklenburg County tax revaluation. - Public Facilities Steering Committee Member, Dave Cable, states that the Steering Committee worked extensively to guide the project, but was not charged with addressing funding sources. Tuesday, Davidson's new Board meets for its second regular meeting after being sworn into office, and the agenda shows some heavy issues already on their plate. The 4pm portion of the agenda includes a closed session "to consult with attorney" - most likely meaning to discuss the lawsuit filed against the Town for its handling of the Griffith Street Hotel project. 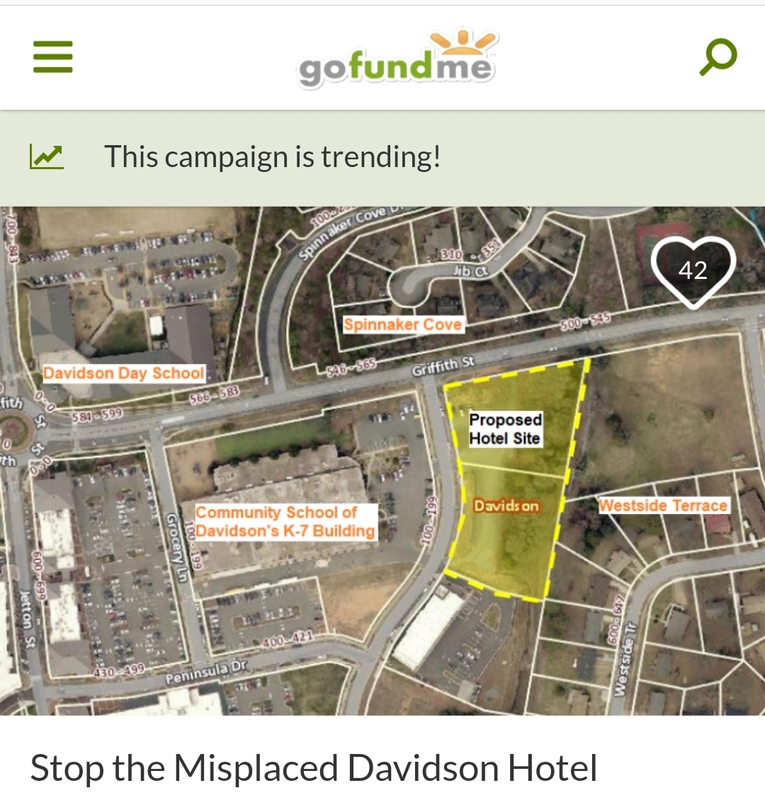 While the current board did not vote to approve the four-story hotel across from Spinnaker Cove next to the Westside neighborhood and adjacent to the Community School of Davidson, the current board has to deal with the fallout from that poor decision. The lawsuit claims several procedural errors on the part of the Town leading up to the November 14th lame duck approval by the outgoing former Board. The lawsuit was filed in the middle of last month, and no formal response from the Town has been filed with the Court. The Board will also hear an update on the Public Facilities (aka New Town Hall) project. The project was also pushed through by the former Board before leaving office. While few in town would question the need for better space for the town's public safety operations, this project was controversial because of the cost and the fact that the former Board refused to let voters decide on the largest spending measure since the Mi-Connection purchase in 2007. If completed as planned, Davidson will have the poshest Town Hall in North Mecklenburg. It will also come with a hefty price tag. If completed as planned along with issuing the GO Bonds for other projects approved last fall, Davidson is looking at a 25% tax bill increase per the Town finance department. The new Board did not vote on either of these projects, but the new elected officials did run against them to varying degrees during last fall's election campaign. That means they now own the outcomes and are responsible for what happens next. As for citizens, it is everyone's responsibility to make sure Town Hall knows the public has not forgotten about these issues. Head over to Town Hall Tuesday. The main meeting starts at 6pm. There will be a public comment section at the beginning of the meeting. You can also reach the entire Board and senior staff at Board@townofdavidson.org. There has been a LOT of swirl in recent weeks about election districts at both the Federal and State levels here in North Carolina. However with recent court decisions things are coming into focus. That is a good thing with candidate filing set to begin on Monday. At the legislative level, last week's decision partially throwing out the use of districts drawn by a court appointed "special master" means that districts drawn for Mecklenburg County by the General Assembly last August will take effect. For NC Senate 41 representing North Mecklenburg and currently held by Jeff Tarte of Cornelius this still means the district will look significantly different than it did in 2016 at the last election. 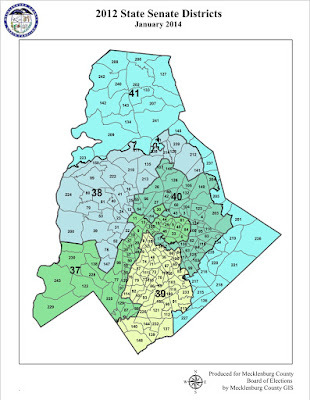 NC Senate 41 will now cover North Mecklenburg and West Mecklenburg rather than the North and East sides of the county. 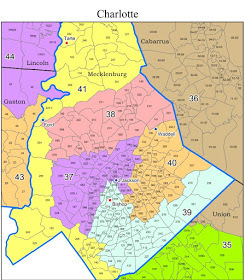 This change will likely make it a more competitive race than in the past as the new NC 41 is less Republican than the old NC 41. Also, the significant change in the precincts that make up the new district means even as the incumbent, Tarte will have to introduce himself to a lot of new voters. Furthermore, several of those new precincts in the southwest of the county skew strongly Democratic. Into that swirling cauldron of change jumps Natasha Marcus of Davidson to challenge Tarte for the newly drawn NC Senate 41 district this fall. Marcus made the announcement of her candidacy this past week. Marcus ran unsuccessfully against Republican John Bradford for the NC-98 House seat in 2014, so she is not new to the state level political fray. She has a proven ability to raise money and should run a disciplined campaign. However, since she is from North Mecklenburg it is unclear how well known she is to the majority of Democratic party voters in the south end of the county where the bulk of Democrats in the new district live. It also is possible of course that she won't end up as the only Democrat filing to run. That would set up a primary situation. From the news reports so far it looks like the Marcus campaign believes the district is truly in play and is hanging its hopes on the fact Hillary Clinton won the precincts that make up the new district in the 2016 Presidential campaign. aShortChronicle took a look at that factor, but also checked the results for all the other state and federal races that cycle in the precincts that make up the new NC Senate 41. The below chart shows which party won each precinct in the given race. The results are interesting. While it is true Clinton won a majority of voters and a majority of the precincts in the new NC Senate 41 in the Presidential election, Republicans won a majority of the precincts in all the other races. 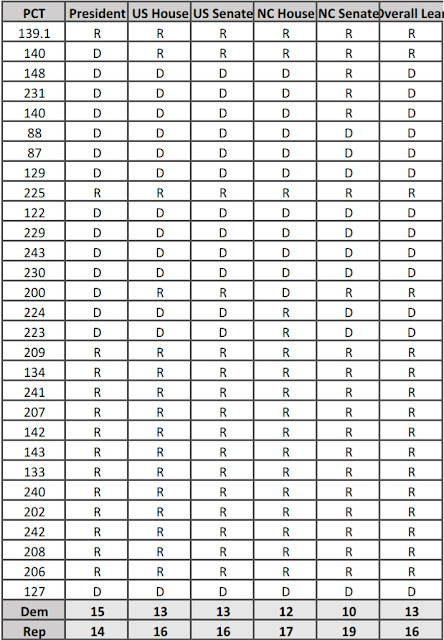 Note: This chart is at the precinct level and does not indicate the actual vote totals in these races. Winning a precinct by 1 vote versus 1000 votes yields the same result. 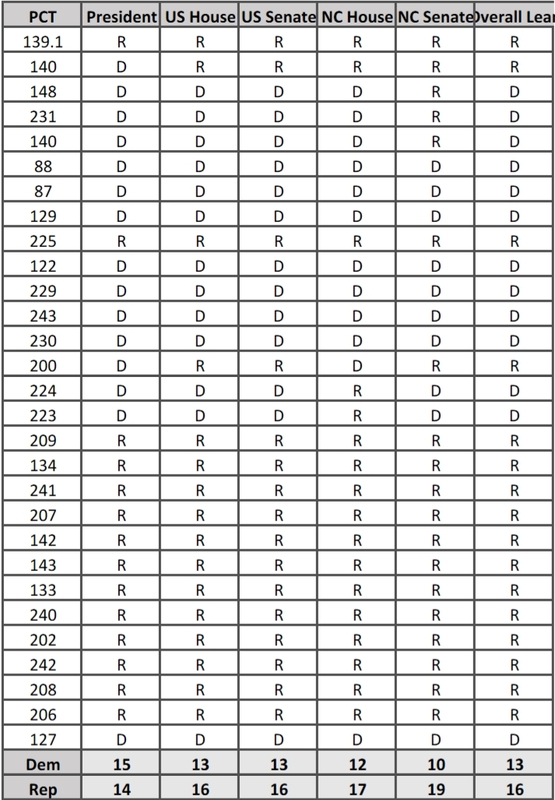 However, when looking at the data this way it shows the general lean of the precincts across all races. Since candidates matter and Trump was clearly a controversial candidate for a lot of people, hanging election hopes on Clinton's win in these precincts may be overly optimistic. On the flip side one can not read too much into the fact that for NC Senate races in 2016 Republican candidates won 9 more precincts than Democrats. While that number seems large, several of these precinct level Republican"wins" in the south end of the district were very close and could easily go the other way - particularly if both candidates are new to voters. Regardless of who you want to win, the dynamics of this race are going to be interesting as it unfolds. People who’ve tried to change government trajectory quickly learn a flirty little secret: changed faces change nothing if employees actually run the show. Davidson’s Mobility Plan roll out illustrates that reality clearly. Knowing I’ll hate myself in the morning for running the white flag up the pole, let’s just call it (for me, anyway) the Mobility Futility. May as well get with the program and embrace Davidson as “a two lane community.” If that doesn’t discourage the brave from rolling down NC 115 (Main Street to us) into our Village or trying to negotiate our Circles what will? I write this with a lump in my stomach after taking Thursday’s afternoon kickoff Mobility Walk and attending the “Community Conversation” starting an hour later. There were cogent points presented on the counterproductive and diminishing returns of vainly trying to widen roadways to accommodate cars and trucks that react in a perverse Peter Principle by expanding to fill the space allotted. Reluctantly, I accepted that likelihood; BUT, I’d already surrendered to the inevitable before the gathered walking group departed Town Hall on its Main Street Mobility experience. Bottom line is that yesterday, today, and we’ll see about another tomorrow, it remains the Planning staff that is running the show in Davidson with its ability to “recommend” while also tweaking and amending (updating?) texts of planning ordinances. Those ordinances are sacrosanct for some applicants who amazingly win “conditional” approvals even when the Planning Board says NO because of “inconsistency” with Town Planning ordinances BUT the staff recommends against PB’s following Town rules. Go figure. That kind of “interesting” way of doing business—lip service to rules and changes for favored applicants, including ones now out of office—eventually inspires or exhausts even a “follow the rules” taxpayer. Truthfully, my final straw was that realization that congestion, truck and auto traffic, weren’t even on the list to be considered. Turns out the 2002 study (many in between) declared CARS BAD, BIKES AND FEET (for walking) GOOD. We operate from that decision. I and others can huff and puff about inadequate infrastructure, or lie down until that feeling passes, noting that planning staff pulled out another ace at January’s Planning Board Orientation meeting. Following its symbiotic relationship with the prior Davidson Board of Commissioners, Planning staff continued muscle flexing after that lame duck BOC welcomed staff recommendation over a multi-thumbs down Inconsistency notice from the Planning Board on controversial placement of a hotel. That worked. Why not go for more? And the emboldened planning staff did. At the Orientation session TOD planning staff rolled out the vaunted Mobility Plan and added a request: that PB members would discuss (presumably favorably) the Mobility Plan with the rest of us citizens. In fact, they were asked to operate as “conversant advocates.” That was the beginning of the end for this writer who recognized the handwriting on the wall, even before the Mobility plan had its public roll out Thursday. We all want “small college Town Davidson,” and nothing is more sure to keep it small than to leave traffic snarled. There were interesting consultant labels for many results of focusing only on biking and walking behaviors presented at Thursday evening’s Community Conversation. To recap and again wave the white flag on the way down, I’ll stay tuned, listen, learn, suggest (especially bypasses, one-way streets, and safety issues). It seems ironic that the same people who planned the Town’s future years ago—and we daily live with how that turned out—will forecast and steer it again. 10. We don’t need a left turn lane from North Main to Davidson-Concord. It gives us a chance to admire the empty storefronts. 8. My favorite YMCA workout is trying to get out of the parking lot. 7. People are so nice when I leave Phase Five of River Run. They always let me out of June Washam. I hope developers build more on that corner soon. 6. I love playing human “Frogger” as a pedestrian at Circles at 30. 5. Building 300 apartments in an area boxed in by the lake, railroad and a lumberyard isn’t irresponsible growth. It’s traffic calming. 4.We don’t need sidewalks in Davidson. I get to meet my neighbors when I walk through their yards. 3. Who needs church? I pray while road biking on Grey Road. 2. I wish the sidewalk on Davidson-Concord was a little closer to the road. 1. I sure hope they use our tax dollars to do another mobility study. Sound familiar? Deja vu! Fast forward five years, circle back around, and here we are at the “Davidson Moves” mobility plan. Citizens are rightfully concerned about wasting taxpayer money on yet another biking and walking study by the same firm. But can we legitimately complain? A close read of the Walks & Rolls Plan reveals a built-in guarantee for Alta Planning (or similar firm) in the implementation section, where one of the goals is to reassess projects in 2018. There is an additional goal to reassess again in 2020 and “consider updating the entire plan.” There should be no shock when the Town of Davidson contracts Alta Planning (or similar firm) again in 2020. The Mobility Plan kicked off with a town walk yesterday afternoon. Ironically, the walk did not head to Beaty or South Potts, where hundreds of high-density housing units are being built at both entrances into town. 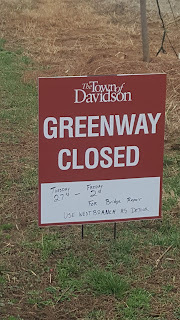 Another moment of irony was learning that the CRTPO grant for $100,000 can be used to hire consultants, but does not allow Davidson to build sidewalks. The evening Community Conversation was staffed with a large amount of Davidson Planners and Alta Planners, and focused on walking and biking, but avoided the Elephant in the Room: our development is outpacing our infrastructure. It’s time to hit the brakes on mobility studies. Have we accomplished the worthy goals of the 2013 study? Have we built five-foot sidewalks on South Potts or South Main Street? Have we made a bike path under Jackson Street? Have we built a ten-foot path on Concord Road between Kimberly Road and Pine Road? Have we built a five-foot sidewalk on the south side of Jetton Street? Have we added sidewalk on Grey Road from Concord Road to Wolfe Street? Have we added sidewalk on Beaty Street? See you at the charrette in March (unless our elected officials put the skids on this rerun). 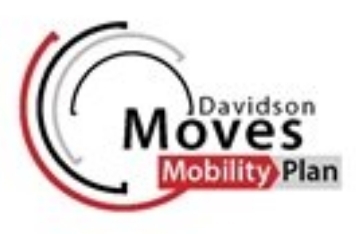 DAVIDSON, N.C – The Town of Davidson is kicking off the Davidson Mobility Plan, a community-driven effort to look at innovative solutions, projects, and programs to help residents move in town on foot, bike, car, and transit and address congestion. The Davidson Mobility Plan will also serve as a Comprehensive Transportation Plan (CTP) that evaluates moving people around town and will provide actionable items such as recommendations, timelines, costs, and funding sources for projects to help the town manage, sustain, and improve the town’s transportation infrastructure. After a bid process, a committee of community leaders, transportation professionals, and town staff selected consultant Alta Planning + Design to help us develop the plan. We encourage the community to participate. Come meet Walter Kulash, a North Carolina native and one of the innovators of the smart and livable transportation movement, including the field of traffic calming (changing motorist behavior through street redesiugn). He will lead a walking tour of the downtown area, offering his observations on what we have done to enhance mobility in town (use of “sharrows” to encourage sharing the road, bike lanes, flashing beacons, etc.) and point out areas for improvement (increase the number of bus stops, create shelters at our bus stops, etc.) Walter worked with the town in 2003 on the Connectivity Plan and Traffic Calming Plan, and will let us know how we have been doing since then to create and maintain a walkable community. This is a great way for members of our community to ask questions, share observations, and interact with one of the nation’s leading experts in transportation. The first Mobility Plan Community Conversation is this Thursday, 2/8, 6-8:30 pm at Davidson United Methodist Church. The charrette process will be held the first week of March. What priorities will the citizens of Davidson highlight? What priorities have already been created by town staff and the mobility study consulting firm? What will the intersection of these priorities look like (pun intended)? A quick drive through the Village in Davidson reveals a surprising number of streets without sidewalks (33 at last count). Given that we lack sidewalks, and Alta focuses on walking/biking paths, it seems that the first priority is to address “Where the Sidewalk Ends”. This all seems pretty self-explanatory. The list above includes some, but not all, of the streets lacking sidewalks. Adding five-foot sidewalks would encourage walking, reduce car traffic, and help keep our residents safe. Our vulnerable population of children, elderly and disabled citizens should be a high priority. The Town of Davidson has provided approximately $25,000 for the Alta study and Charlotte Regional Transportation Planning Organization (CRTPO) has funded the remaining $100,000 through a grant. Just for kicks, how many sidewalks could we have built with $125,000? See the below chart for an estimate. Nearly 2 Catawba Avenues worth could have been poured! 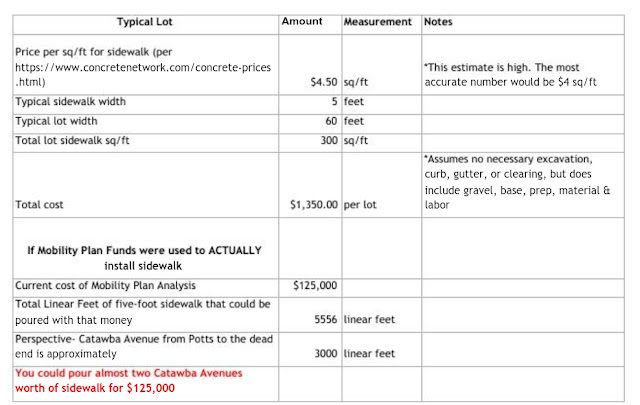 Maybe we can start building sidewalks rather than paying firms to study our town and tell us we need sidewalks? One way we could save money is to build five-foot sidewalks all over town, rather than using eminent domain to build ten-foot, Big Fat Sidewalks in the front yards of historic homes. Plan to listen, brainstorm and comment on mobility this month. Details: The Community Conversation will kick off the Davidson Mobility Plan. The project team, consisting of town staff and consultants, will convene a public forum to outline the process for the development of the Davidson Mobility Plan, present the results of their assessment of Davidson’s existing transportation conditions, and solicit community input with regard to specific challenges and ideas about what should be investigated in the mobility plan over the next several months. The evening will be kicked-off by Walter Kulash, one of the innovators of the smart and livable transportation movement. He will set the stage for an engaging community conversation on how Davidson thinks about transportation and mobility. The session will also include a “hands-on” exercise using maps. Community input will form the basis for developing the issues, opportunities, and challenges to be explored during the development of the mobility plan over the next few months. Summary of Feedback: 5:​30 p.m. – 7:00 p.m.
Summary of Feedback 5:30 p.m. – 7:00 p.m.
​Final Presentation of all four days’ work in progress: 6:00 - 7:00 p.m. Details: A charrette is a collaborative session in which a group of designers draft solutions to a problem based on stakeholder and community input. Members of the community interested in transportation are invited to stop by the design studio throughout the week. The design team will work on creating the mobility plan and invites citizens to offer continual input and as well as monitor the work in progress throughout the week. Each session will culminate with a “pin-up” of all work developed throughout the day, and on Thursday, March 8, we’ll host a final presentation of the week’s work.